It is well-known that locks play a leading role in our lives. In order to be fully protected, we must keep our locking systems in good working conditions. Hence, if we want to increase the life span of our locks, we must undertake some maintenance activities from time to time. First of all, you should lubricate your locking system annually to insure sticking does not occur at all. Lubricating the lock as well as the bolt will help it work properly all year round. However, supposing that you do not pay enough attention to those maintenance activities and your door lock gets stuck, it might help to use a silicone spray before calling for help. The pins of your lock might be jammed and the spray will ensure smooth function of the pins. If nothing works, contact our emergency lockout experts for help. Secondly, you must always use the key that came with the lock. In that event, you will not have to deal with broken keys. As far as your family members’ access is concerned, it might help to get a duplicate key of your residential lock. Moreover, if you need to provide access to your housekeeper, it is best to get a master key, which can control both the deadbolt and doorknob and get secondary key for the housekeeper. 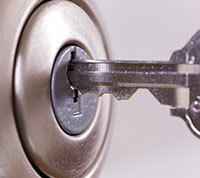 Secondary key can access the doorknob only and your house is safe against unauthorized access or break-ins. Locks can be problematic when the weather is cold or rainy. Hence, choose a lock with a grade 2 or upper quality, made of stainless steel. In that event, you will avoid being taken by surprise by some technical problems caused by rusted locks that do not open or close properly.